IRVINE, CA--(Marketwired - Dec 10, 2013) - Toshiba America Information Systems Inc., Telecommunication Systems Division (Toshiba - www.telecom.toshiba.com) today announced Toshiba's SIP Trunking I-VoIP Service (SIP Trunking) that integrates with its on-premises IPedge® and Strata® CIX™ business telephone systems. Toshiba's integrated SIP Trunking service and equipment enable businesses to use a single-vendor business telephone solution. This allows businesses to purchase both a premises-based system and the corresponding service from the same manufacturer; thereby, eliminating interoperability issues and challenges of using a mix of providers for these services. "Together, Toshiba's SIP Trunking I-VoIP Service with IPedge or Strata CIX creates a fully supported, expertly integrated, premises-based business telephone solution -- all from a single vendor," said Brian Metherell, vice president and general manager of Toshiba America Information Systems Inc., Telecommunication Systems Division. "Users can depend on Toshiba's highly respected reliability for both service and equipment." Plans include Unlimited Local and Domestic Long Distance calling (subject to Toshiba's Acceptable Use Policy). Toshiba's SIP Trunking I-VoIP Service is now available in the 48 continental states from Authorized Toshiba Dealers. Roll-over Trunks, which allows calls to DIDs to be configured to roll over to a second SIP Trunk, enabling calls to be handled by multiple sites. Roll-over Trunks, which allows calls to DIDs to be configured to roll over to a second SIP Trunk, enabling calls to be handled by multiple trunks on the same Strata CIX system. Trunks are limited to 24 channels for each Strata CIX system. For more than 24 channels, additional trunks will be needed. 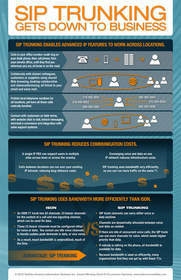 For Toshiba's SIP Trunking I-VoIP Service Infographic, visit www.telecom.toshiba.com/multimedia/content/SIP-Trunking-Gets-Down-to-Business.cfm.